Christmas has always stressed me out. That stress has only worsened since I became a mom. 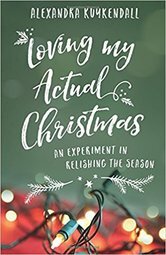 For that reason, I was intrigued by Alexandra Kuykendall’s Loving My Actual Christmas: An Experiment in Relishing the Season. In this book, Alexandra sets out to conduct an experiment in how she can be more present during her actual life in the weeks leading up to Christmas. Each week, Alexandra identifies a need (following the themes of Advent: Hope, Love, Joy, Peace as well as Christmastide), and then implements an experiment “of capturing the essence of the season”. She then writes daily journal entries about the process before summarizing what she's learned and reflecting on what practices she’ll keep after her official experiment is over in a format reminiscent of Jen Hatmaker’s Seven. Throughout Loving My Actual Christmas, I also appreciated Alexandra’s willingness to let her readers peak inside her family’s traditions. One of my favorites was seeing how she allows each girl in her family a chance to shop for the others in their family. I love this idea so much that I’m hoping to incorporate it with my own daughter so that even this Christmas, there will be stuff under the tree that she chose for each person. What if we all did? Perhaps then we’d actually be able to enjoy Christmas, time with families, and the celebration of Jesus’ birth without it becoming just another stressor on our calendars. Without a doubt, Alexandra’s Loving My Actual Christmas will challenge and help haggard moms to do this, to “notice the goodness God has offered in the here and now” rather than “overspending, overeating, undersleeping, and underrejoicing.” What’s more, its short size means busy moms will realistically be able to find time in their schedules to read it – either before Advent begins in order to plan for a less stressful Christmas season OR during Advent as a devotional. Disclosure: I received a free copy of Loving My Actual Christmas from Baker Books in exchange for a fair and honest review.